Growing mushrooms is on my mind, it is the perfect season and if the west coast gets the amount of rain predicted, we should bank on that being the perfect year to grow mushrooms…. and make rain barrels but that will be in a separate bog post! On our farm we grow mushrooms in all kinds of ways, because mushrooms have all kinds of ways they benefit things in addition to being edible. They help the soil, they are a bio-filter, they are used in companion planting and they are also yummy! You have probably heard of mycorrhiza, “Mycor” – “rhiza” literally means “fungus” – “root” and defines the mutually beneficial relationship between the plant and root fungus. These specialized fungi colonize plant roots and extend far into the soil. Mycorrhizal fungal filaments in the soil are truly extensions of root systems and are more effective in nutrient and water absorption than the roots themselves. More than 90 percent of plant species in natural areas form a symbiotic relationship with the beneficial mycorrhizal fungi. We add it to our compost mix. Mushrooms are amazing things that can be trained to eat even toxic waste like oil in oil spills! What might I want mushrooms to eat here at the farm? Well making a Livestock run off ditch before the creek was something we did. 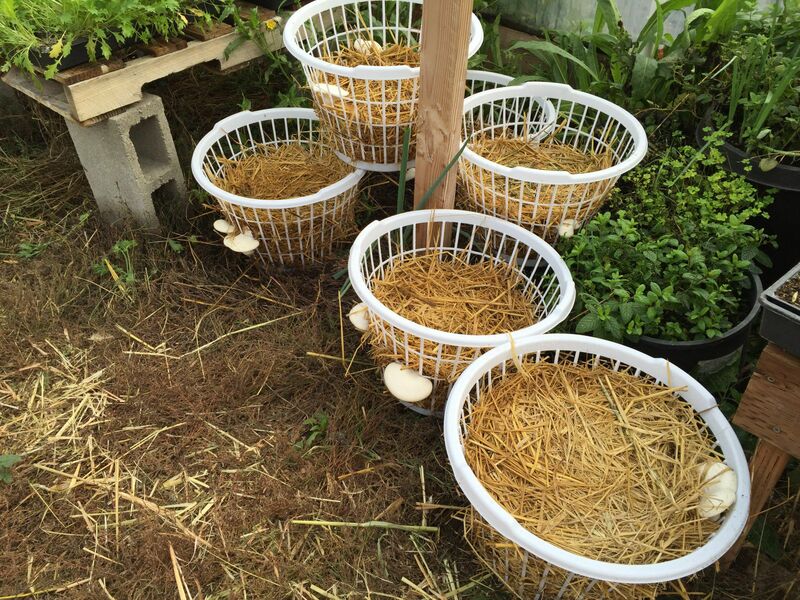 Something we plan on doing in the future is making a composting toilet with mushrooms! Mushrooms have been shown to increase yield in certain crops ( and the opposite for certain crops), the key is learning which mushroom goes with what crop. So far we know, Oyster mushrooms go well with berries. The way you do this is simple, you just layer straw, wood shavings in the mulch around your crop and keep the straw moist. I call Mushroom savings account, mushrooms that will take longer to fruit but will provide more mushrooms in the long run. This would drilling mushrooms plugs into fresh cut tree stumps. You will want the tree stomp to be fresh, so the mycelium does not have to compete with other fungi. I call the checking account the quick way to get mushrooms. You can do this in grow bags but we do it in plastic laundry bags from the dollar store. We layer staw mulch with the mycelium of choice and possibly some wood shaving that will feed they particular mushroom. The return on this is fast but you only get one small crop.